The recent solution to the OS X BSOD ‘Superbug’ provided by DPS Computing Limited has undergone rigourous testing which has now been completed and declared a success. Many users, mainly of mid-2010 MacBook Pros have been desperately searching for answers to the OS X BSOD ‘superbug’ which has been rendering their Apple machines useless. With kernel panics, due to this problem, occurring every 5 to 10 minutes after boot, the problem all but disabled many of Apple’s flagship products. Multiple avenues of investigation were performed by DPS Computing, including hardware issues, driver issues and third party software ‘triggers’. Apple have failed to come up with a solution currently, after first acknowledging the problem 12 months ago. Although there was initial problems when using gfxCardStatus 2.2.1, these problems have been confirmed to be rectified by using gfxCardStatus 2.0. Apple are due to release the next major version of OS X – Mountain Lion, later on this month with predictions for the date being the 25th July, based on information regarding the release of Lion. It is widely believed that Apple may release a permanent solution to the OS X BSOD superbug, to be included with Mountain Lion, by possibly including a rewritten version of the nVidia graphics card driver. This would be an ideal solution for Apple customers, who would then be able to resume using dynamic switching and getting the full performance from their Macs. Results from our initial thorough testing of gfxCardStatus version 2 in response the OS X BSOD ‘superbug’ are very promising which means that we now have a fully working and documented solution which has been documented previously. Although not ideal this will no doubt come as a relief to many MacBook Pro mid-2010 model owners who are currently experiencing the disabling OS X BSOD bug. Tests show that after multiple reboots the “Integrated only” option continues to work with each reboot, unlike the experience we had with gfxCardStatus v2.2.1 in testing. The developer has put this down to the updated gfxCardStatus ‘triggering’ a defect related to the nVidia graphics card which in turn triggers the OS X BSOD. 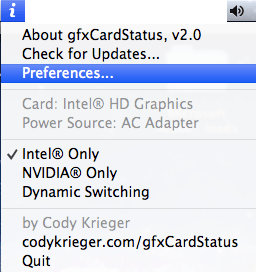 One thing that is key to note from our testing of v2.0 is that even with the ‘run at startup’ option enabled, gfxCardStatus doesn’t appear to actually start upon booting and therefore it is necessary to run the application explicitly by double clicking it in the Applications folder (or an alternative location where you have copied it to, if not to Applications). This problem is however fairly minor compared to the consequences of not using it, so I’m sure we can live with temporarily. It would be advisable that users pin gfxCardStatus to the dock to serve as a reminder to start the application upon reboot. To make life easier, so that the application is just ‘click and run’ for the purposes of what we need it to do some default settings should be changed (which then will obviously, not subsequently require resetting first time). These settings changes are necessary to prevent the nVidia card being used in anyway or the ‘dynamic switching’ function becoming inadvertently activated. Firstly, you should notice an ‘i’ at the top of your display – this may display as an ‘n’ in some circumstances, or may appear as a ‘d’ which means that the nVidia card is currently in use. The ‘i’ refers to the Intel card. After we change the settings, you want to verify that the ‘i’ is definitely showing, otherwise something has gone wrong. 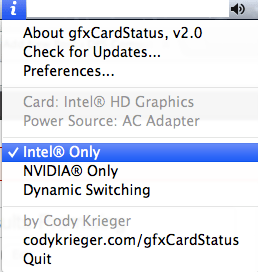 And there you go, you’ve now got gfxCardStatus all set up to banish the OS X BSOD superbug! 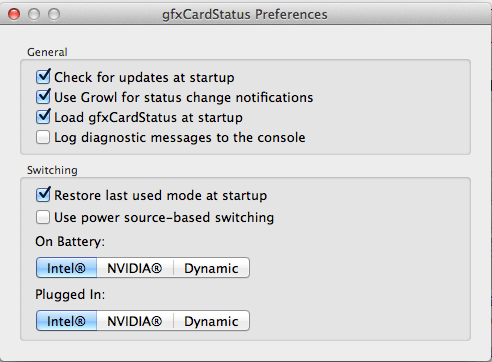 Don’t forget, always remember to start up gfxCardStatus after a reboot if it fails to start itself! With Mac OS X Mountain Lion due out later this month many MacBook Pro mid-2010 model users will be hoping that the long anticipated fix to the OS X BSOD superbug will be included with this release. Following the discovery by DPS Computing that gfxCardStatus 2.2.1 (the latest stable release) was a ‘one time wonder’ in regards to solving the OS X BSOD ‘superbug’ we decided to follow the advice of the gfxCardStatus developer and downgrade to 2.1, which shouldn’t have the same issue. We can confirm during testing that downgrading to 2.1 had the same effect as using 2.2.1 – after one reboot, the screen would be garbled and unreadable using the ‘Integrated Only’ option. Another solution that was suggested by the developer is to downgrade to any version of gfxCardStatus 2.0 or above, especially if it has worked previously for you. Unfortunately, we were not using gfxCardStatus before the problems started affecting our testing machine, however we have downgraded to version 2.0 of gfxCardStatus to see if this helps resolve the issue. Testing is currently ongoing however initial results are promising (although this was the case while using the initial 2.2.1 version). That having been said, we are hopeful that version 2.0 may work for us, as there has been some positive feedback on the gfxCardStatus forums stating that this has worked for users trying to thwart the robust OS X BSOD superbug. We will continue testing gfxCardStatus version 2 and update you. We are planning to continue to run the test plans involving actions where the OS X BSOD and kernel panics frequently occur and reboot the machine several times to check that the solution continues to work after reboot. Following our research into alternative third party software triggers for the resilient OS X BSOD ‘Superbug’ we identified a couple of reports from users who thought that MozyPro (the cloud based backup facility – also available as a home edition – MozyHome) was a possible trigger, as their problems lessened after uninstalling it. There has been some other reports of crashes on both Windows and OS X not directly related to this specific bug also. So based on this knowledge, we decided to test out the theory on our machine, and removed MozyPro completely and deactivated our previous solution, to identify if MozyPro was indeed affecting the kernel panics. After uninstalling Mozy we proceed with our tests. Although there was slightly longer uptime than we have previously seen, the differences were insignificant and likely due to experimental variation (i.e. because we changed some of the ‘variables’, uninstalling Mozy, as part of the test). The first kernel panic occurred within 9 minutes of our test beginning. So, based on our tests the use of MozyPro (or other Mozy products) does not have any bearing on the current OS X BSOD superbug. Please note that MozyPro is sometimes marketed as MyBusinessWorks in the United Kingdom.